During my time in the north island, I visited the town of Waitomo, famous for being the only place in New Zealand (and one of the few in the world) to have glowworm caves. But of course, just seeing the glowworms would be rather dull, especially in a land with so many outdoor activities, so some inventive kiwis came up with a new sport – black water rafting. The glowworm caves are actually caverns slowly carved out by underwater rivers, so somebody had the bright idea of rafting this underground river – so not only do you get to see the glowworms, but you also get the excitement of rafting! Plus, the guide companies can charge a lot more for ‘black water rafting’ than just a ‘glow worm cave walk & tour’. Clever. 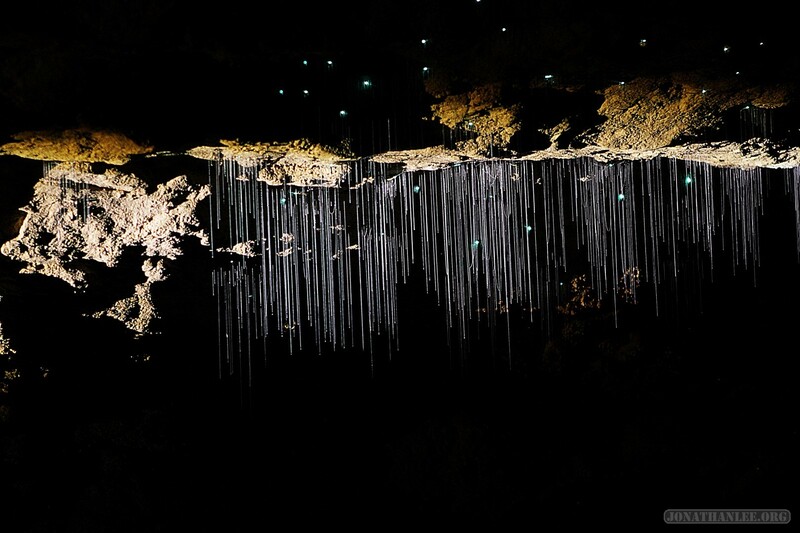 Glowworms are insect larva that behave somewhat like spiders – they lay down a trap of sticky lines hanging down from the ceiling, start glowing – luminescent poop! Fortunately the poop stays in the larva, and doesn’t drop down into the mouths of awestruck tourists. This light attract insects that fly towards the false moon, the insects get caught in the sticky lines, and the glowworm enjoys a delicious meal.